and friends had rallied in Union Square, chanting "We have the power!" and "No Justice, No Peace!" The crowd had then surged into the street, while two smaller contingents made their way to the St. Francis and the Hyatt, all intent on demonstrating their resolve to beat back the ongoing attacks by the hotel bosses on our working conditions and livelihoods. San Francisco, they were fighting back against a wave of speed-ups, layoffs, firings and benefit cuts by the hotel big-wigs. Before the day was over, 200 workers were arrested in Chicago, and nearly 100 in San Francisco, in well-planned acts of non-violent civil disobedience. On August 14, contracts for 9,000 San Francisco UNITE HERE! Local 2 hotel workers expired. 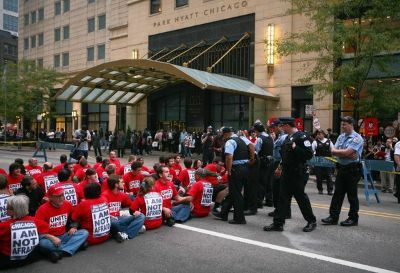 On August 31 contracts expired for 6,000 hotel workers in Chicago. 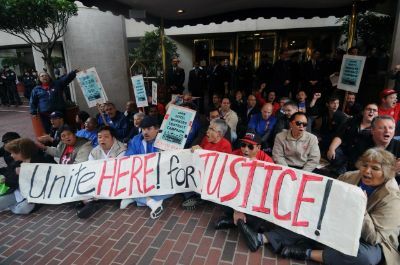 That same day, three Hyatt hotels in Boston fired 100 room cleaners, many of whom had worked for the Hyatt for decades. These hard-working sisters, who had been earning around $15 an hour plus medical benefits, were replaced overnight with another set of workers earning $8 an hour with no benefits at all, employed by a Georgia sub-contractor perversely named Hospitality Staffing Solutions. "PUT UP, OR SHUT UP." San Francisco hotel contract negotiations have been going nowhere. Meetings with the Hyatt, Hilton and Starwood (the corporation that runs the St. Francis, among several other San Francisco hotels) have been exercises in futility. Their attitude is that the bad economy gives them the perfect excuse to be bastards. "Put up, or shut up" seems to be their message. Since shutting up is not an option, Thursday was our next move. As hundreds marched up Stockton Street from the Union Square rally, our two bands headed for the St. Francis and the Hyatt. St. Francis group. We hung out for a few minutes at Geary and Powell, pretending to be waiting for the 38-Geary. We didn't fool anybody. 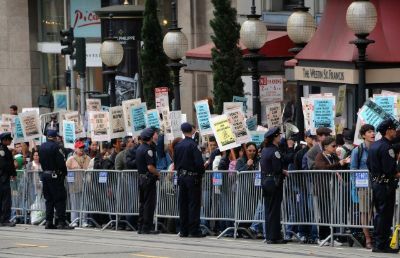 Then, as the main body of marchers looped around the Grand Hyatt and headed down Powell Street, we rounded the corner, marched past the cabs and the doorman, stationed ourselves on the steps to the hotel's main entrance, and sat down. For the next hour or so, the St. Francis rang with our chants. Crowds of hotel workers and onlookers marched by. Cameras held by reporters and tourists alike snapped pictures. A few brave St. Francis guests attempted to pick their way through and over our bodies, some succeeding, others retreating. We kept expecting the police to arrive and tell us to leave. Instead, the cops threw up barricades to keep people out of Powell Street, monitored picketers on the sidewalk, and ignored us. Apparently the St. Francis was reluctant to shine a spotlight on themselves or on our resistance. No managers or security guards appeared. Nor, apparently did they ever ask the police to clear the steps. Emboldened, we crowded closer to the front doors, and guests found it impossible to get past us into the lobby. Still, no reaction from the hotel or the officers of the law. The same situation developed at the Hyatt. No managers, no security, no cops. At the Hyatt, the decision was made to move the action into the hotel lobby. At that point, the hotel had no choice but to react. The police arrived, did their duty, and the result was 43 arrests. At the St. Francis, we decided to move into the street. Those cable car tracks right in front of the hotel were an irresistible lure. Soon we were sitting down in the middle of Powell Street. The cable cars and traffic came to a halt. The crowd of workers watching the action cheered and chanted. The police tried three times to read a dispersal order, and three times our chants and singing drowned them out. More tourists snapped more pictures, something much more interesting to show their friends and relatives back home than photos of the pigeons in Union Square. Of course, we had strategically placed ourselves so that the St. Francis was in the background of all those shots. They hadn't succeeded in getting their precious marquee out of the limelight. The failed attempt by the San Francisco hotel bosses to ignore our civil disobedience actions mirrors their strategy at the negotiating table. They haven't presented any serious contract proposals, even though the contract expired well over a month ago. 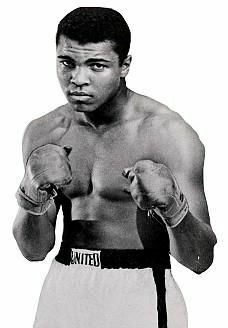 Their game plan seems similar to that of the indomitable Muhammad Ali, who would sometimes go to ropes and let the likes of Joe Frazier and George Foreman pound away on him, tiring themselves out. Then, with a weakened opponent, Ali would come out swinging and put them away. That may well be the hotel bosses' plan. But it won't work. UNITE HERE! and Local 2 are too smart to fall for this trap. We didn't tire out Thursday, and won't tire out in the future. We will keep delivering punches, but each one will be measured and deliberate. As Ali once said, "If you even dream of beating me you'd better wake up and apologize." 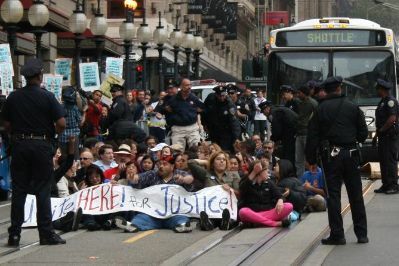 Not long after our two busses arrived at the Tenderloin police station, we were herded inside in small groups, given citations, and then released. We gave our citations to the Union lawyers waiting outside for us. It was now about 7pm. But we were hardly done for the evening. Several of us headed for the Actors Theatre on Bush Street, where there was a performance of a play based on John Steinbeck's famous novel, Grapes of Wrath, a benefit for the Local 2 Solidarity Fund. As Ma Joad says, "We're the people that live. They can't wipe us out, they can't lick us. We'll go on forever 'cause we're the people." For more information, see the UNITE HERE! website and the Local 2 website.